A World Besieged, Lost in Darkness, Awaits a Champion... The Bloodwraiths. They are the most terrifying weapon at the command of King Arorahn: resurrected fallen soldiers, now undead, with superhuman abilities and an appetite for flesh. There is one defense against them - the Phoenix Strike, known only to the exiled Axendrei Knights. Giddeon, a blacksmith's apprentice whose dreary life is illuminated by his devotion to his beloved, Crysta, has no idea what lies in wait for him when he is conscripted into King Arorahn's army. He doesn't know that his father, Hadrigahn, a fugitive Axendrei Knight, has been training him in secret, using a suppression spell to block Giddeon's knowledge. On the eve of his conscription, Giddeon learns there is to be a battle that Crysta and the other villagers plan to watch. Hoping to see his beloved one last time, Giddeon sneaks away to watch ... not knowing that once his innocence has been broken by witnessing acts of grotesque violence, the spell on his mind will also break. Captured by the Bloodwraiths, Giddeon is thrust into a world of gladiatorial combat. He must rediscover his true self, while guarding the secret of the Phoenix Strike, which has the ability to save his world. Will Giddeon remember the truth of who he is, and regain the power to combine all aspects of his essence, which will give him the superhuman strength of an Axendrei Knight? And will Hadrigahn succeed in training a group of fledgling Knights to battle the Bloodwraiths rampaging across the land? Sons of Titan: Rise of the Bloodwraiths is the stunning epic opening volume of a series that will keep you on the edge of your seat. Join Giddeon on his quest, and prepare to be enthralled from the first page to the last. Bloodwraiths. They are the most terrifying weapon at the command of King Arorahn: resurrected fallen soldiers, now undead, with superhuman abilities and an appetite for flesh. 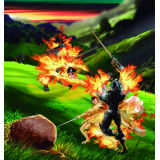 There is one defense against them – the Phoenix Strike, known only to the exiled Axendrei Knights. Giddeon, a blacksmith’s apprentice whose dreary life is illuminated by his devotion to his beloved, Crysta, has no idea what lies in wait for him when he is conscripted into King Arorahn’s army. He doesn’t know that his father, Hadrigahn, a fugitive Axendrei Knight, has been training him in secret, using a suppression spell to block Giddeon’s knowledge. On the eve of his conscription, Giddeon learns there is to be a battle that Crysta and the other villagers plan to watch. Hoping to see his beloved one last time, Giddeon sneaks away to watch … not knowing that once his innocence has been broken by witnessing acts of grotesque violence, the spell on his mind will also break. Captured by the Bloodwraiths, Giddeon is thrust into a world of gladiatorial combat. He must rediscover his true self, while guarding the secret of the Phoenix Strike, which has the ability to save his world. Will Giddeon remember the truth of who he is, and regain the power to combine all aspects of his essence, which will give him the superhuman strength of an Axendrei Knight? And will Hadrigahn succeed in training a group of fledgling Knights to battle the Bloodwraiths rampaging across the land? Sons of Titan: Rise of the Bloodwraiths is the stunning epic opening volume of a series that will keep you on the edge of your seat. Join Giddeon on his quest, and prepare to be enthralled from the first page to the last.